Two research teams have uncovered the gene family that allowed us to evolve our impressively large brains. 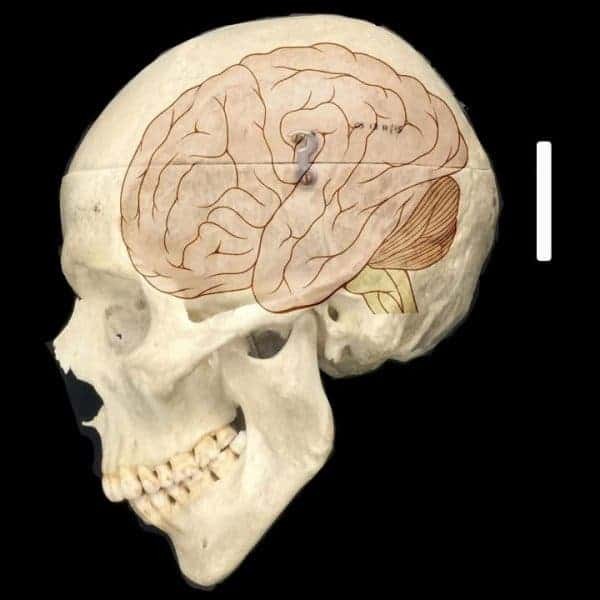 A human skull overlaid with an illustration of the human brain. Compared to other organisms on the planet, our globs of gray matter are unusually big. That’s actually quite a fortunate turn of events since we owe them our success as a species today. But why we have such big brains is a different question altogether — one that two recently-published papers attempt to answer. The two teams identified a genetic family christened NOTCH2NL as the likely catalyst for the evolution of our brains over the last 3 million years. The gene, which is located in a part of the genome previously linked to neurodevelopmental disorders, seems to play an important role in human cortex development by delaying stem cell specialization into neurons — in the long run, this results in more overall neurons being developed. The gene is also exclusive to humans (lacking even in our closest relatives), and is heavily expressed in stem cells in the cerebral cortex. “Our brains got three times as big primarily through the expansion of certain functional areas of the cerebral cortex, and that has to be a fundamental substrate for us becoming human. There’s really no more exciting scientific question that I can think of than discovering and decoding the mysterious genetic changes that made us who we are,” says bioinformatician David Haussler, co-senior author of one of the papers. Haussler’s team was busy comparing genes expressed during brain development in humans and macaques when they discovered that only human cells sported NOTCH2NL. Further testing revealed that orangutans also lacked this gene and that our closest living relatives — gorillas and chimps — only carry incomplete, inactive versions. After piecing together as much of its evolutionary history as they could, the team believes that it was borne out of a process known as gene conversion. They write that the process was likely applied to repair a non-functional version of NOTCH2NL, which itself first emerged as a partial duplication (i.e. a mutation) of the neurodevelopmental gene NOTCH2. The team believes this repair took place some 3 to 4 million years ago — which is right around the time that we see human fossils with increasing brain sizes. After it was repaired, but before we diverged from our common ancestor with Neanderthals, NOTCH2NL was duplicated two more times, the team adds. The other team, led by developmental biologist Pierre Vanderhaeghen found NOTCH2NL while searching for human-specific gene activity during fetal brain development. Because the genes Vanderhaeghen’s team was searching for are generally described known and hard to distinguish from the variants in other species (which are more common), the team developed a new RNA sequencing analysis method for specific and sensitive detection of human-specific genes in fetal tissue. They uncovered 35 genes unique to us that are active during fetal brain development — including the NOTCH2NL family. What set it apart from the rest is the important hole NOTCH2 plays in controlling whether cortical stem cells produce neurons or regenerate more stem cells, they explain. Artificially expressing NOTCH2NL increased the number of progenitor stem cells in the brains of mice embryos. Further tests with an in-vitro cortical development model based on human pluripotent stem cells revealed that NOTCH2NL can substantially expand the number of cells in the culture, which then generate more neurons. “From one stem cell, you can either regenerate two progenitor cells, generate two neurons, or generate one progenitor stem cell and one neuron. And what NOTCH2NL does is bias that decision in a slight way towards regenerating progenitors, which can later go on to make more neurons. It’s a small early effect with large late consequences, as often happens with evolution,” Vanderhaeghen says. When NOTCH2NL was removed from the genomes of human stem cells used to grow patches of tissue, differentiation occurred faster but resulted in fewer final neurons. “If you lose NOTCH2NL, it leads to premature differentiation of cortical stem cells into neurons, but at the same time the very important stem cell pool gets depleted,” says Jacobs. There is still a lot of things we don’t understand about NOTCH2NL. Haussler’s team notes that they were only able to look at the genomes of a small sample of patients and that their models couldn’t address the later stages of cortical development — when NOTCH2NL might become even more important. For now, however, it seems clear that NOTCH2NL had a key role to play in the evolution of the human brain. And, in a way, it could offer part of the answer to that age-old question. We’re here, in part, because a gene mutated a few million of years ago — and it made us smart. The papers “Human-Specific NOTCH2NL Genes Affect Notch Signaling and Cortical Neurogenesis“, and “Human-Specific NOTCH2NL Genes Expand Cortical Neurogenesis through Delta/Notch Regulation” have both been published in the journal Cell.